Recovery Yields Need a Boost? 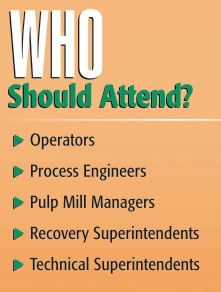 Find your path to better profits and mill efficiency through improved recovery. Attend the Recovery Short Course offered by the Pine Chemicals Association. Register before December 31 for a $100 savings. PCA and TAPPI members get an additional discount. Increase recovery yields and mill revenue. Improve pulp production and uniformity. Learn the basics of soap acidulation to CTO and how to improve yields. Apply safety "best practices" from top industry experts. Get personalized answers to your operations questions. Learn expected yields from different systems. Troubleshoot problems in recovery systems. Earn 1.5 CEUs or 15 PDUs. Discover more from the 2016 recovery course brochure. We look forward to seeing you in Atlanta, March 1-3, 2016. Make your hotel reservations by February 7 to assure availability at the group rate.